The FY 11 Arts Budget: Is My Hair On Fire? There is concern about the state of arts funding in D.C., including the potential for a tax on live performance. Policy-makers must find money to preserve social services, and it’s reasonable to be concerned. The arts are frequently pitted against social services in funding battles. However, due to regular and informed advocacy over the last 48 months, it seems likely that the arts will not be cut further. The proposed FY 11 budget includes a 10% cut for the arts this year, which is in line with general reductions in development spending. Due to no fault of their own, many city Safety Net programs have been decimated by the economic decline, including, as an example, low income housing. The Housing Trust Fund, which supported affordable housing for the most needy in the District, had grown over the last decade based on a dedicated appropriation allocating15 percent of deed recordation and transfer taxes (from sale of real estate) to the fund. But when the market crashed, and people stopped buying homes, the fund also crashed, and money for low-income housing projects disappeared. Policy-makers have to find new revenue streams because money for existing programs has disappeared. Last year, the council took a number of steps, including: DC’s general sales tax rate was increased from 5.75 percent to 6 percent; The Cigarette tax was raised from $2 per pack to $2.50; The Gasoline tax was raised from 20 cents per gallon to 23.5 cents, matching the rate in Maryland, and revenues from the tax were moved from DC’s highway trust fund to the city’s general fund. With all of the things they did do last year, there were a number of things that they considered, and did not do. One example is a tax on live theater performances. In some ways, a ticket tax would make sense. 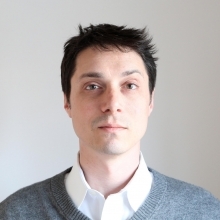 Last year, Ed Lazere, Director of the DC Fiscal Policy Institute, wrote a post in Greater Greater Washington, suggesting that the city should impose a theater ticket tax. He noted, “If you go to an event at the Verizon Center or a Nationals game, the ticket sales tax is 10 percent. Movie tickets are taxed at the basic rate of 5.75 percent. But people who buy tickets to theater performances — plays, musicals, opera, dance, etc. — don’t pay any sales tax at all.” Ed was one of the people responsible for securing the housing trust fund appropriation mentioned earlier, and is a respected voice in public policy considerations. When the DC Advocates for the Arts visited with Councilmember Kwame Brown last year protesting arts funding cuts, his staff discussed the possibility of a dedicated tax for the arts generated from a ticket tax. Before the bill could even be introduced, however, arts businesses, already completely strapped by the down economy, were successful in convincing policy-makers that the proposal would actually reduce total revenues. (A tax would effectively make ticket prices more expensive, and this could affect number of tickets sold.) This year, again, council members want to raise revenue so that they can save programs. So again this year, a lot of ideas are being floated, including the same theater tax idea. Given that it’s election season, it’s unlikely that arts interests will be completely ignored to raise a small amount of tax revenue. The DC Advocates for the Arts will keep you informed as the budget debates proceed, and we hope that you will participate to whatever extent you are able. Dance critic Claudia La Rocco published a piece on her WNYC performance club blog recently exploring the notion of Artistic Citizenry. The topic is trenchant; from Shepard Fairey to the White House it seems that Americans are engaging with political issues through art. Nothing particulary new, but for this generation the energy is rising toward artistic political engagement. Many artists today – including Fairey – clearly work from a personal sense of activism. La Rocco’s post, titled The Art of Citizenship, explores some of the issues raised with that type of engagement. She notes, “We tend to have broad stereotypes of what it means for an artist to be a good citizen: making work that protests Vietnam, doing community workshops for impoverished children, etc. … For me, bound up in the idea of being an activist is a certain form of resistance, of re-thinking our assumptions.” La Rocco’s words express her understanding of the potential for artists to influence the issues of their day; citizen artistry as counter-culture, independence, and progress. On the same day that La Rocco published her piece, the Boston Globe published a visual celebration of the People’s Republic of China’s 60th birthday celebrations. 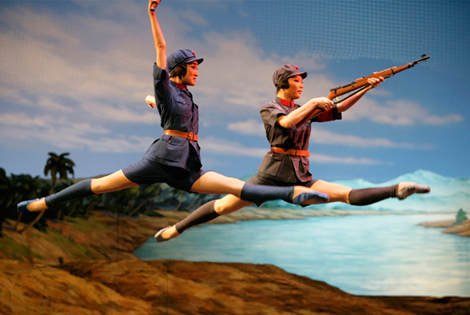 Included in that set of images is the image to the left, which carries the description: “Dancers from the National Ballet of China performs the “Red Detachment of Women” ballet at the Tanggu Great Theater, part of the celebration of China’s 60th anniversary, in Tianjin, September 26, 2009. The “Red Detachment of Women” is a full-length Chinese ballet depicting a peasant woman’s journey into the PLA, combining Western dance style with Chinese cultural elements. (REUTERS/Jason Lee)” These two items represent two sides of the spectrum of Artistic Citizenry. On the one side is independence, and on the other, direct service to political power. The recent NEA scandal shows that even in the United States we may be vulnerable to artistic citizenry directly harnessed by political power. A choreographer I worked for a few years ago told me a story about when Yvonne Rainer came to perform in Washington. She was planning to do a piece in which her dancers wore the American flag. The producers had some qualms about the production, and Rainer was called to a meeting. I was told that Rainer wore an American flag – only – when she went to the meeting, and that when told she couldn’t wear it, she took it off and conducted the rest of the meeting in the buff. The compromise that was reached allowed a flag to be placed on the floor of the dance space; Rainer purchased a flag that filled almost the entire floor, including the entry-way, forcing performers and many audience to walk on the flag. The story reminds me that independence is a choice for each artist. Still, independence of thought – as understood by all types of citizens – is a value that needs supporting. Artists’ careers grow secure fostering their connections with like-minded groups. Artistic citizenry can be nurtured not just by critics, but by the funding community. Does DC Need Arts Advocacy? I am the chair of the DC Advocates for the Arts. I REALLY care about the arts. The studio – the dance studio – is the place I feel most at home in the world. I believe in the arts, because they are my home. But you don’t make much money in the dance studio. You support the dance studio time (mostly) outside of the studio – through grants, commissions, performances, and teaching. That money… it’s hard to get. I’ve gotten really involved in arts advocacy, in part, because I believe in myself. Advocating for the arts en masse has been a way for me to defend my own choices. But at this point I’m uncertain what I’m fighting for. Funding is the only issue I’ve been able to get people to talk about regarding Arts Advocacy. Not priorities in funding, not efficiency in funding, just funding. I believe DC does need arts advocacy. But not to advocate for funding. Due in no small part to the granting programs that spend the money, over the last ten years there are a larger number of mid-sized organizations drawing funding with professional development staff, and the stream of small orgs and individual artists stays constant. Nobody talks about patronage, cause it doesn’t serve them to do so, but there is a reason why more money is spent in NW DC, and the reason is the relationships that exist. Not the quality of the artists, or the possibility for arts businesses. Collegial support systems develop between staff, consultants and arts administrators, and no rules exist to manage those relationships toward the public good. Arts businesses are just businesses. This city has – per capita – a very large arts scene, as appropriate to a locale where a major revenue stream is tourism. But how do we efficiently ensure that every child receives real arts education? How many stable mid/large sized organizations should the city be supporting? How can funding programs really encourage the kind of art that will best serve this city? What categories of art do we need to encourage to best serve this city? How can the arts leverage community development? How can we maximize government investment in the arts for revenue growth? We cannot expect politicians to actually be experts on everything under the sun. Advocates must inform and educate themselves so that they can contribute to the dialogues, and pressures, which politicians manage on a daily basis. Does dc need arts advocacy? Yes. Because the politically expedient decision and the right decision are sometimes two different things. We might wish that arts business leaders would selflessly contribute to open ongoing intelligent policy discussions, and the needs of the city. But perhaps it’d be better to plan within the reality that exists, and build a broad, participation-driven advocacy organization. Author Robert BettmannPosted on April 15, 2009 April 23, 2010 Categories Art, Personal, PoliticsTags DC Arts Funding3 Comments on Does DC Need Arts Advocacy?